The Smiths move from Tunbridge to Royalton, then to Sharon, Windsor County, Vermont, where they rent a farm from Solomon Mack, Lucy’s father. Births of Joseph Jr., Samuel Harrison, Ephraim, and William mentioned. First and second in a series of seven visions or dreams given to Joseph Smith Sr. First, the dream of the box, and second, the dream of the tree of life. The loss of the Tunbridge farm was a considerable trial to us, for it deprived us at once not only of the comforts and conveniences of life, but also a home of any description. After selling the farm at Tunbridge, we took our three oldest children and moved only a short distance to the town of Royalton. 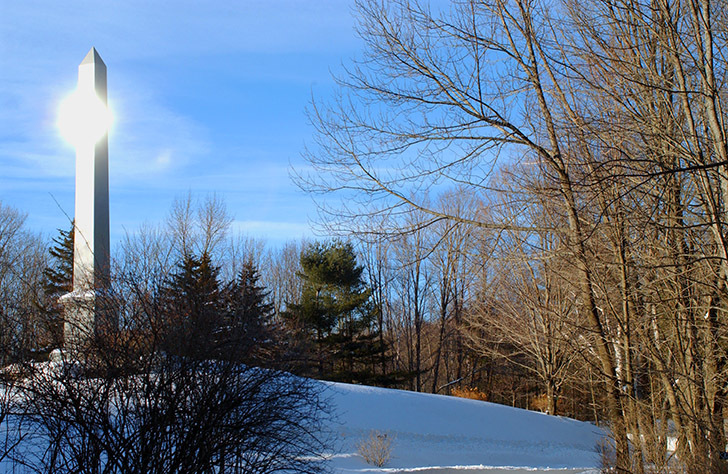 Here we resided a few months, then moved again to Sharon, Windsor County, Vermont. Here my husband rented a farm of my father, which he cultivated in the summer season and in the winter taught school. In this way my husband continued laboring for a few years, during which time our circumstances gradually improved until we found ourselves quite comfortable again. A 38 1/2 foot granite obelisk commemorates the birth of Joseph Smith here in Sharon, Windsor County, Vermont. Here it was that my son Joseph was born, December 23, 1805, one who will act a more conscious part in this work than any other individual. We moved thence to Tunbridge. Here we had another son, whom we named Samuel Harrison, born March 13, 1808. We lived in this place a short time, then moved to Royalton, where Ephraim was born, March 13, 1810, who died in his infancy. We continued here until we had another son, born March 13, 1811, whom we called William. Stones mark the original foundation of the cabin where Joseph Smith, Jr. was born on December 23, 1805. The birth date of Sophronia, oldest daughter of Joseph and Lucy Smith, was recorded in Tunbridge as May 17, 1803; Mother Smith cites it as May 18, 1803. At the time of this move from Tunbridge eight miles to Royalton, Alvin would have been five years old, Hyrum three, and Sophronia a few weeks to a few months old. The farm the Smiths rented from Solomon Mack is located on the line dividing the townships of Sharon and Royalton near the summit of old Dairy Hill about five to six miles from Royalton. The move to here could have been as early as the summer of 1803 and as late as the early winter of 1804. Ephraim lived but eleven days. 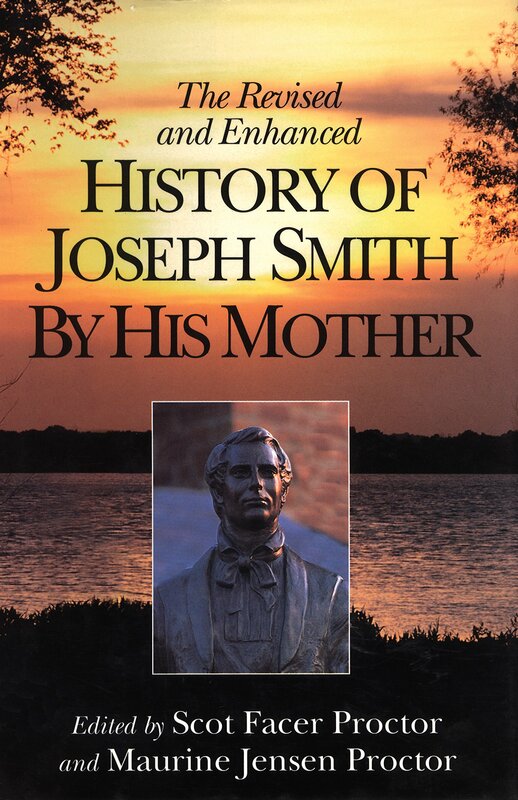 Note that three of Joseph and Lucy Smith’s sons were born on the same date (March 13); namely, Samuel, Ephraim, and William. This begins a series of at least seven dreams or visions given to Joseph Smith, the father of the Prophet, between the years of 1811 and 1819. Concerning this vision or dream of her husband, Lucy states in the Preliminary Manuscript the following heading: “First Vision of Joseph Smith, Sr. Received the next month after William was born.” That would mark the date of this vision in the month of April 1811. The Lord said through the prophet Joel: “And it shall come to pass afterward, that I will pour out my spirit upon all flesh; and your sons and your daughters shall prophesy, your old men shall dream dreams, your young men shall see visions: and also upon the servants and upon the handmaids in those days will I pour out my spirit” (Joel 2:28-29). Hugh Nibley makes an interesting point about this part of Joseph Smith Sr.’s dream: “When the prophet’s father dreamed himself lost in ‘this field [of] the world,’ he ‘could see nothing save dead, fallen timber,’ a picture which of course faithfully recalls his own frontier background” (Lehi in the Desert. . . . [Provo, Utah: Deseret Book Co., and Foundation for Ancient Research and Mormon Studies, 1988], p. 44). Lebanon is located about twenty-five miles southeast of Royalton, Vermont, just across the Connecticut River into New Hampshire. This was the Smiths’ longest move in New England and took place likely in the late spring of 1811, sometime after the birth of William, or early summer of that same year. By the time of this move, Joseph and Lucy had six children: Alvin, thirteen; Hyrum, eleven; Sophronia, eight; Joseph, five; Samuel, three; and William, a few weeks to a few months old. It is most likely that this dream was given to Joseph Smith Sr. sometime in the summer of 1812, after the birth of Catharine (July 28, 1812). The two children that were yet to be born in the Smith family were Don Carlos (March 25, 1816) and little Lucy (July 18, 1821). It is also possible that in the vision the two children that were to be gathered in with the family were their firstborn son, who had died, and Ephraim, who lived only eleven days. Over thirty correlations exist between Joseph Smith Sr.’s dream and Lehi’s dream or vision of the tree of life found in 1 Ne. 8.